When it comes to understanding the metrics for success, few verticals have it harder than B2B service companies. Your sales cycles are longer, there are less targets, and you have just as much competition as your B2C counterparts. While often your margins and revenues are higher on a per acquisition basis, it can be difficult to look outside those for insights into whether your strategy is paying off. 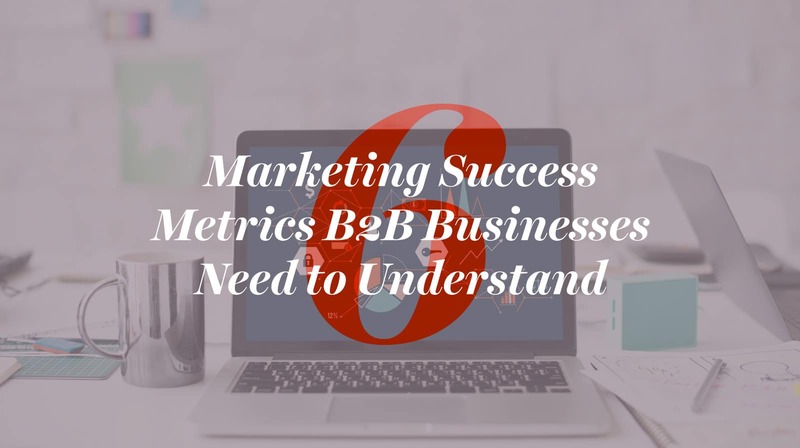 We’ve worked with countless B2B companies over the years and understand some marketing metrics that can help you know whether you’re successful or not. So here are 6 of them that we’ve found are helpful. Sales and marketing, marketing and sales, like any marriage, there’s been strain over the years. But when the two click – it’s magic. Getting your teams aligned is the best way to see positive growth for any B2B company. So how do you create a metric from this? Start by finding out how many meetings that the two have had and what those outcomes were. How many pieces of insight has your sales team given your marketing department? How many times has marketing created content to help your sales team close? How successful have they been? There are quantifiable insights you can gather to see if your teams are working together for the benefit of the business. Right now I’m writing a blog, does that mean that it will have any use down the road? Let’s just put it this way, if you can’t determine your content has success, don’t create the content. So how do you figure that out? Well, there’s a couple of ways to do this. First, use Google Analytics to find out your traffic to that page. Are people reading it? What’s the time on page? Second, look at your social engagement for posting that content. Clicks, views, Likes, Comments, Shares, it’s all important. Last, but certainly not least, if you have a call to action or a download on the page how many people took action. These Key Performance Indicators (KPI’s) will help you know whether or not what you’re doing is having an effect. What is Your Bottom of Funnel Engagement? Now that you’ve sent the proposal to your prospect, are they still interacting? It’s easy to see engagement when someone is learning about you. But once they’ve done their research, and know what it’s gong to cost them, are they still engaging. These engagements late in the buying funnel can be the difference between closed won or lost. If you aren’t seeing them active on your website or social media after the fact, time to re-engage them. Use drip email campaigns targeted at their needs to get them back and learning why you’re the best choice for a vendor. In apps like SharpSpring you can assign points based on behaviors. If you don’t have anything sophisticated like that (which you should give it a shot) there are other ways to do this in a more manual way. Spreadsheets on your sales contacts where they get a point for interacting, visiting the website, or any other metric you find important will help you determine how many touches it takes to close your sales. Fix that! Using UTM codes and landing pages for each of your ad channels can help you know what kind of traffic each is giving you. Then, next go round you can tell your ad partners, sorry you didn’t bring me enough sales based on these metrics. I’m moving my half of spending to that which works. In keeping with the spend smart philosophy, marketing attribution metrics will help you determine your ROI across all your marketing channels, not just ads. If you know where it’s working, spending more time and resources on those things will help improve your ROI as a whole. Then determining which aspects are better inside that channel will improve that ROI even more. For example: if you know that your organic search is bringing you 70% of your sales. You could double down on SEO, but it might net the same result. Instead, find out what those leads searched for, double down on targeting those keywords. You could end up spending less and getting better results.